In the summer of 1167, a small band of Anglo-Norman adventurers set sail from Pembrokeshire and landed on the County Wexford coast. Within two years, the Norse ports of Wexford, Waterford and Dublin had fallen; and the Gaelic Irish were mustering against these well armed invaders. In October 1171, Henry Plantagenet - King Henry II - himself arrived in Ireland, anxious to re-assert his authority over these Anglo-Norman nobles and to add this promising new dominion to his extensive Anglo-French empire. It was a defining moment in Irish history, marking the establishment of the Lordship of Ireland: in effect creating the first English colony. John Lackland was the youngest son of Henry II and brother of Richard I "The Lionhearted". In 1177, while John was only 9 years old, Henry II made him Lord of Ireland - a position held by John until becoming king in 1199. 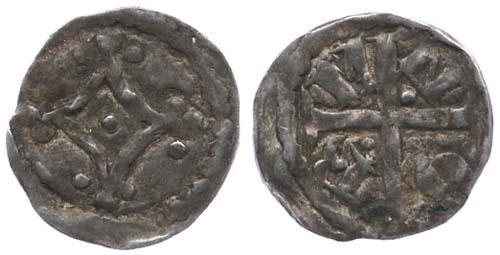 During his Lordship, a series of farthings were produced in Ireland with a mascle on one side and for letters from the name of the moneyer on the other. Edward Colgan in For Want of Good Money states: "It is possible that under a hundred of these coins survive." 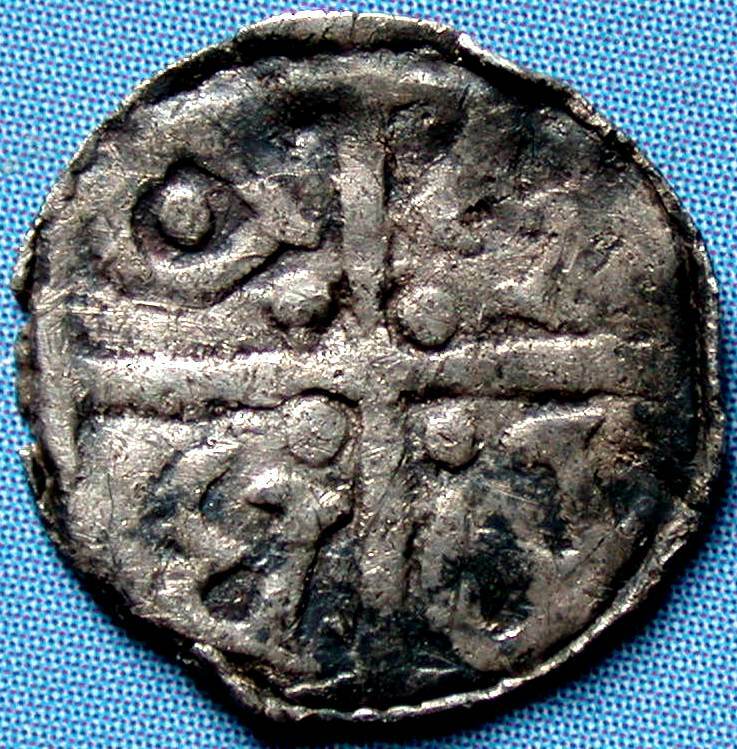 The farthings of John must have remained in circulation in Ireland well into the reign of his son Henry III, for in 1250 Henry granted Dublin certain tariffs on goods for "for the enclosing and strengthening of that city." 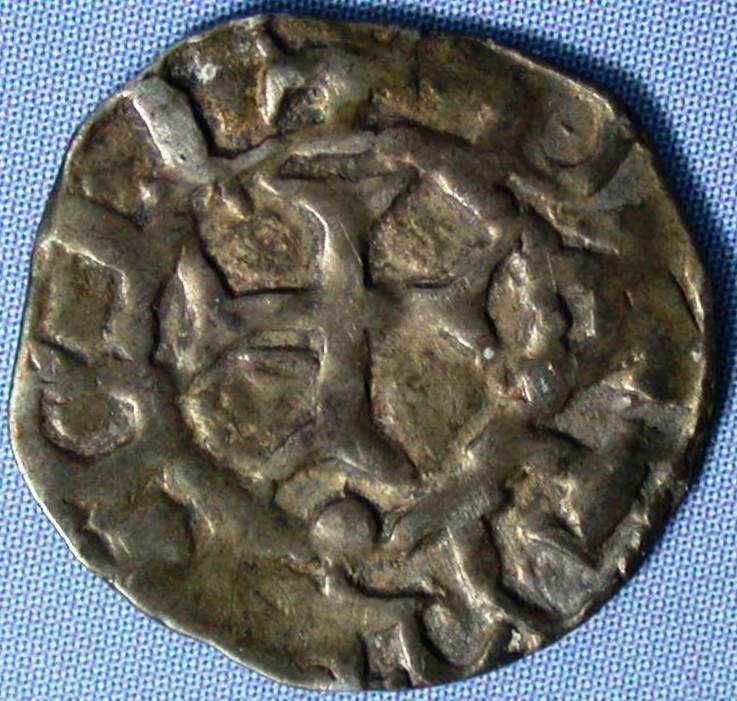 This grant lists a number of goods to be taxed at one "quadrans" which was the medieval latin term for a farthing. Click here to learn more about this grant. Contemporary forgeries of these farthings occassionally appear on the market. Click here to see a contemporary forgery and to find out more. 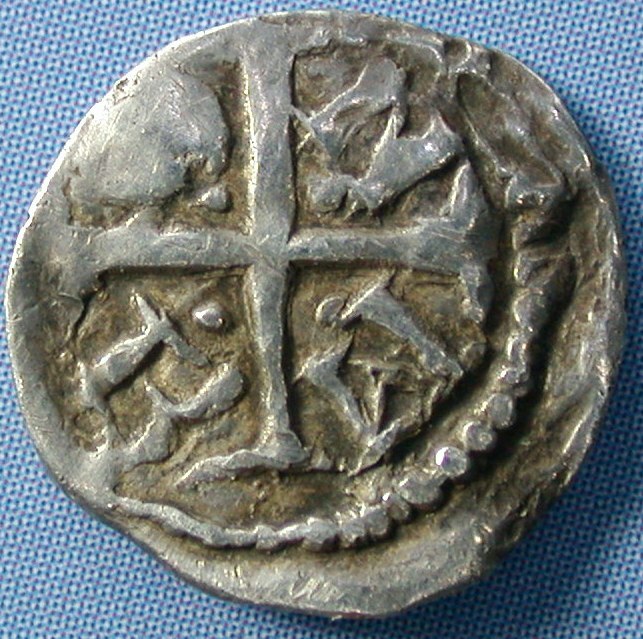 No farthings of John as Lord of Ireland were known until 1806, when several were discovered along with some Anglo-Irish halfpence of the same period. 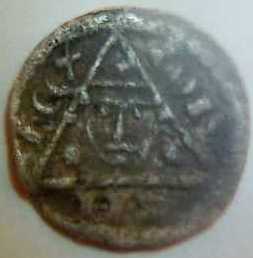 The farthings had the same moneyers names as found on some of the halfpence from this hoard (ref. Lindsay, J. A View of the Coinage of Ireland, p.25. 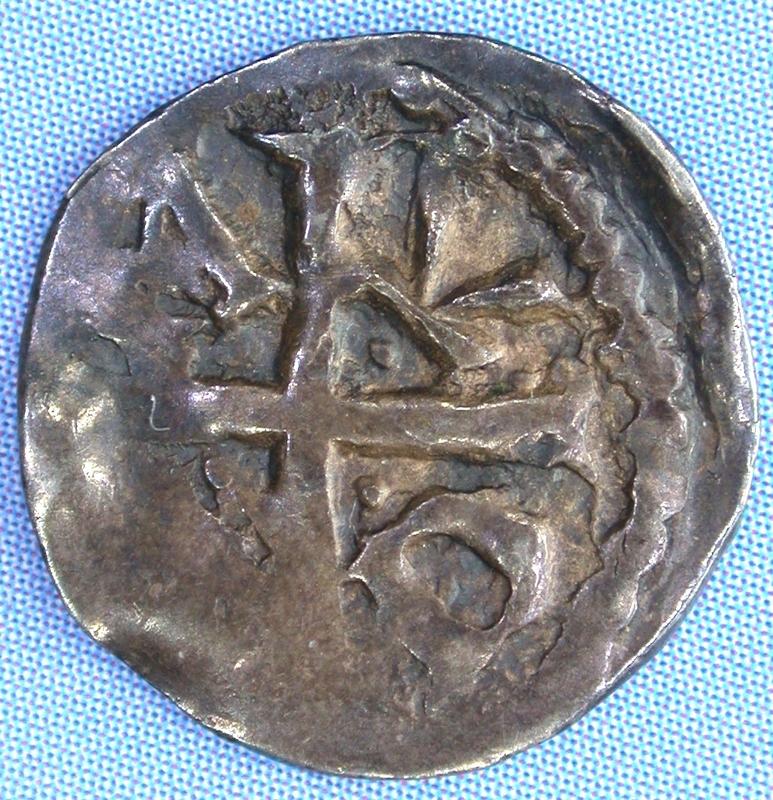 Moneyers name as letters within the angles of the obverse cross. Letters facing in towards the centre of the cross. 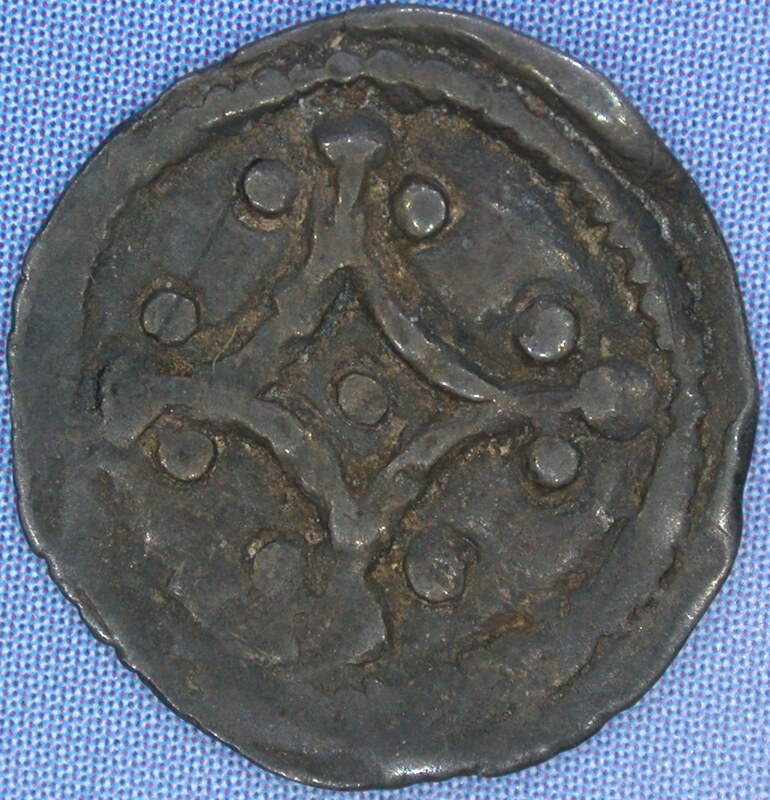 Letters of moneyer's name is read clockwise (i.e. NORM). Reverse: Mascle with trefoils at the points. 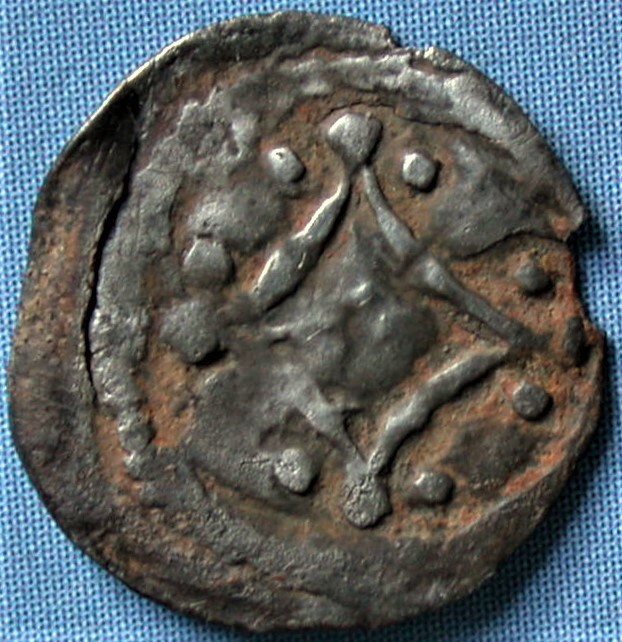 Letters of moneyer's name is read anti-clockwise (i.e. MRON). (68) Grainger [donated to the Ulster Museum in 1891], letters inward and retrograde - R reversed. "Anglo-Irish Coins in the Ulster Museum" was published. 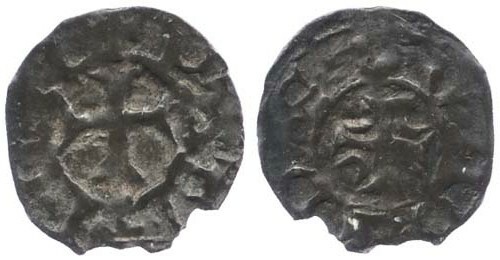 British Museum - not seen but included as a supplimental coin in "Anglo-Irish Coins in the Ulster Museum" (plate XVI, 4). 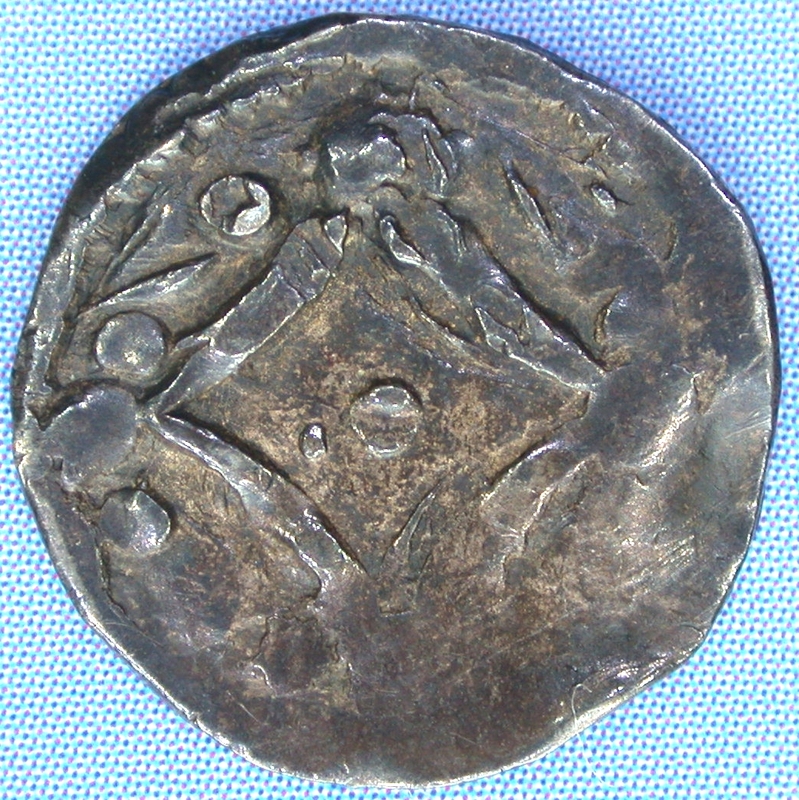 Letters of moneyer's name is read anti-clockwise (i.e. EBOR). (70) Carlyon-Britton , ex. Dudman 725 (Sotheby's, 15-19 Dec. 1913), Bearman Collection, H. Clark(e). 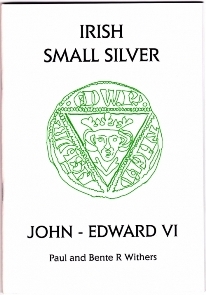 A further example is in the Dr Rogers Collection, donated to the British Museum (referenced and illustrated in Withers' "Irish Small Silver"). 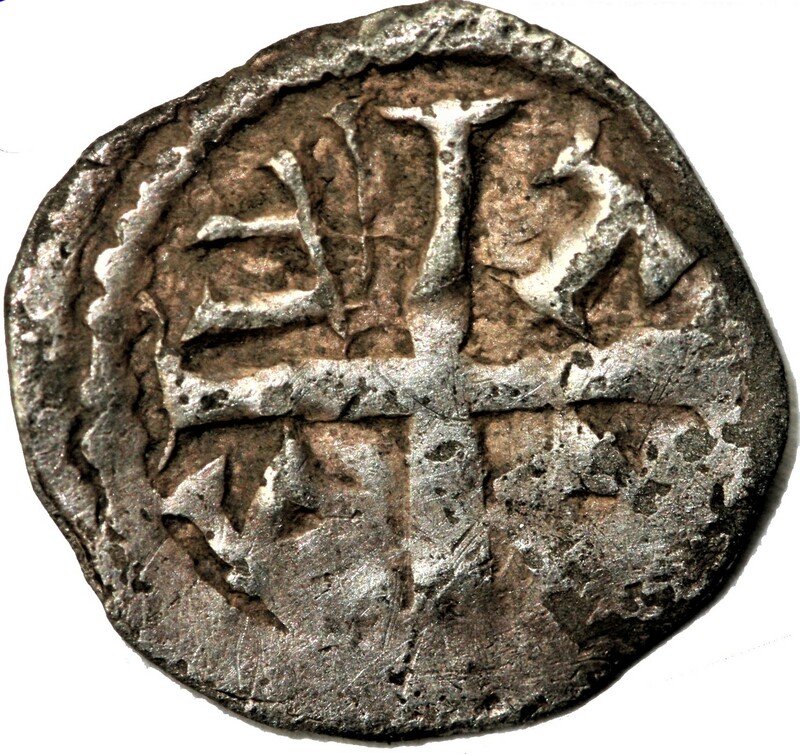 Moneyers name as letters within the angles of the obverse cross. Letters facing outwards - except M which faces inwards. 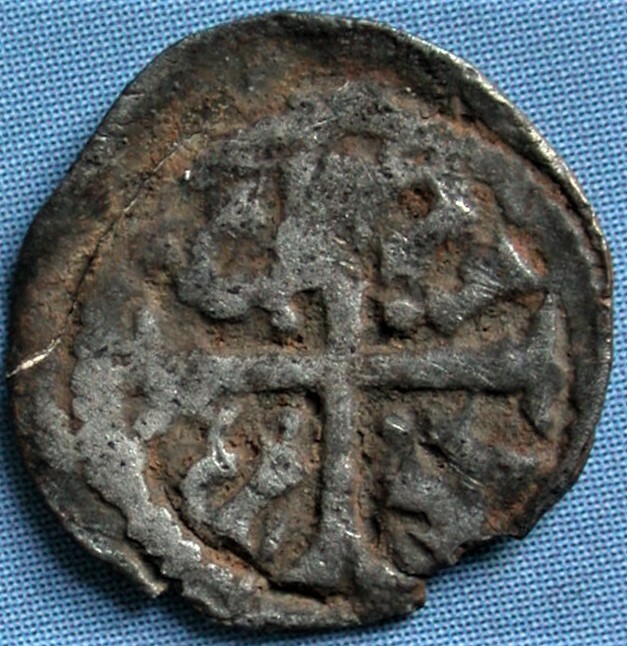 Moneyers name as letters within the angles of the obverse cross. Letters facing outwards. (131) Pilgrim Trust [donated to the Ulster Museum in 1957], ex. Lockett 507 (Glendining, 28 Nov 1951) letters outward and D retrograde. (69) Carlyon-Britton , ex. Cunningham 561 (Glendining, 31 Jan to 2 Feb 1951) - lettering as on 131. 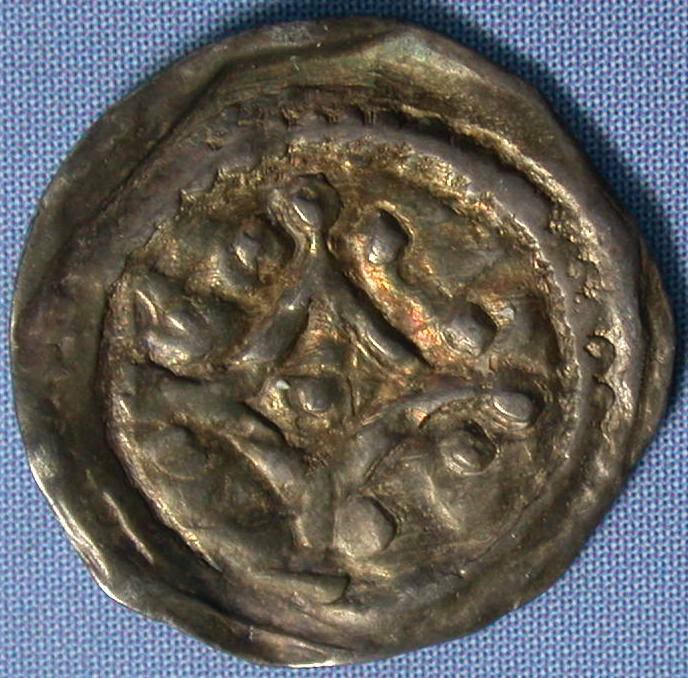 A further example is in the National Museum of Ireland, Dublin (referenced and illustrated in Withers' "Irish Small Silver"). 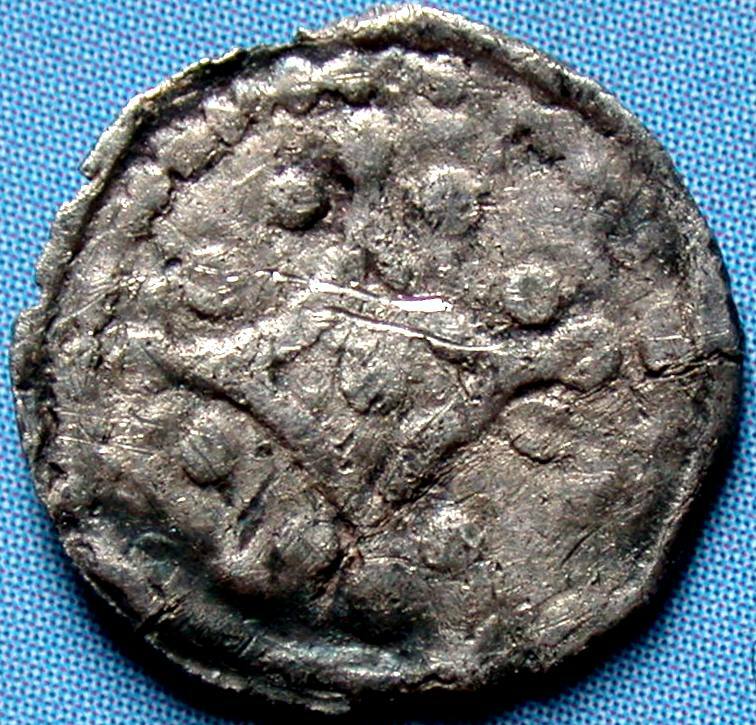 No example of this coin was in the Ulster Museum at the time "Anglo-Irish Coins in the Ulster Museum" was published. 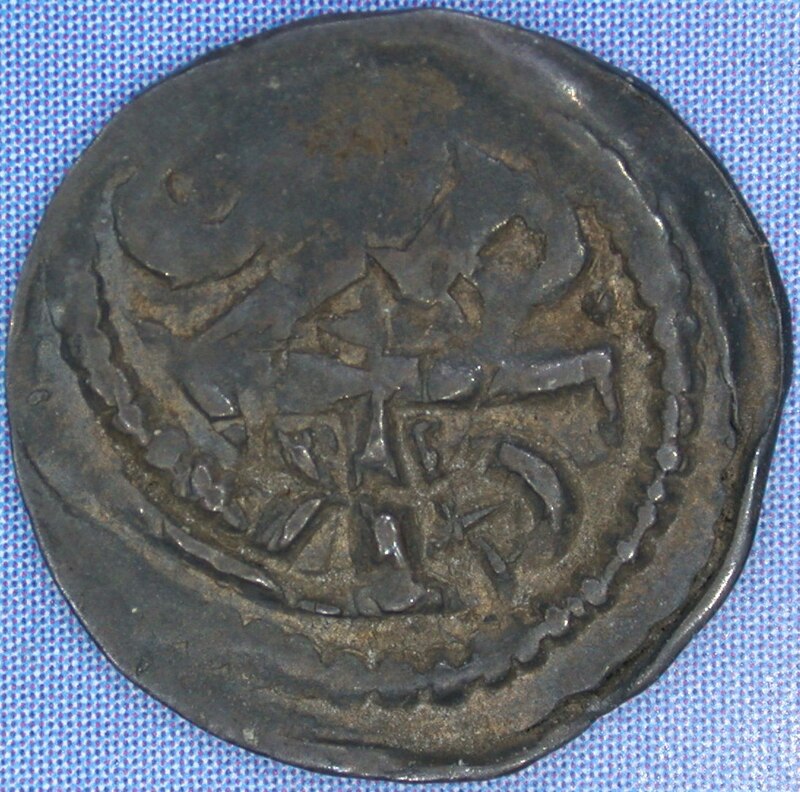 A coin of this moneyer was included in Simon's "An Essay towards an Historical Account of Irish Coins," (2nd edition) 1810, plate 11. No example has been seen by this author. Pellet in the center of the letter C in MARC. No other example of this coin is know. (140) Carlyon-Britton , dies 1/2. (131) Pilgrim Trust [donated to the Ulster Museum in 1957], dies 1/2, ex. Lockett 506 (Glendining, 28 Nov 1951). Letters/shapes within the angles of the obverse cross. there are also key elements of the design missing. 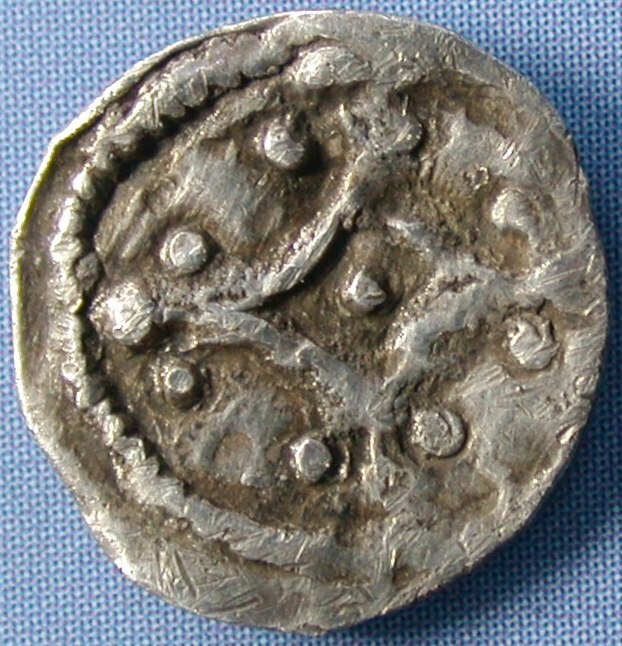 Another example is in the National Museum of Ireland, Dublin (referenced and illustrated in Withers' "Irish Small Silver"). Around a cross potent with crescents in the angles. (330) Pilgrim Trust [donated to the Ulster Museum in 1957], ex. Lockett 509 (Glendining, 28 Nov 1951), Sir John Evans Collection (Lockett acquired coins from this collection that were not required by the English National Collection). (331) Pilgrim Trust [donated to the Ulster Museum in 1957], ex. Lockett 509 (Glendining, 28 Nov 1951), Sir John Evans Collection. (333) Acworth [donated to the Ulster Museum in 1961], ex. Col. R.H. Wallace Collection. (337) Carlyon-Britton , ex. Walters Collection (private sale on 19 Sept 1919). Around a voided cross potent. Note: An example is in the National Museum of Ireland, Dublin (referenced and illustrated in Withers' "Irish Small Silver"). (341) Grainger [donated to the Ulster Museum in 1891] - reads CRAGF. (342) Robb [donated to the Ulster Museum in 1937] - reads CRAGF. Around a voided cross pommee. 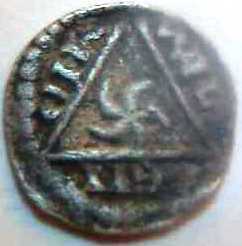 Crowned bust in triangle, stars either side. (340) Carlyon-Britton , ex. Longbottom 317 (Sotheby 14-15 May 1934). Another example (legend reads RO BE RD) is in the collection of Richard Walshe (referenced and illustrated in Withers' "Irish Small Silver"). 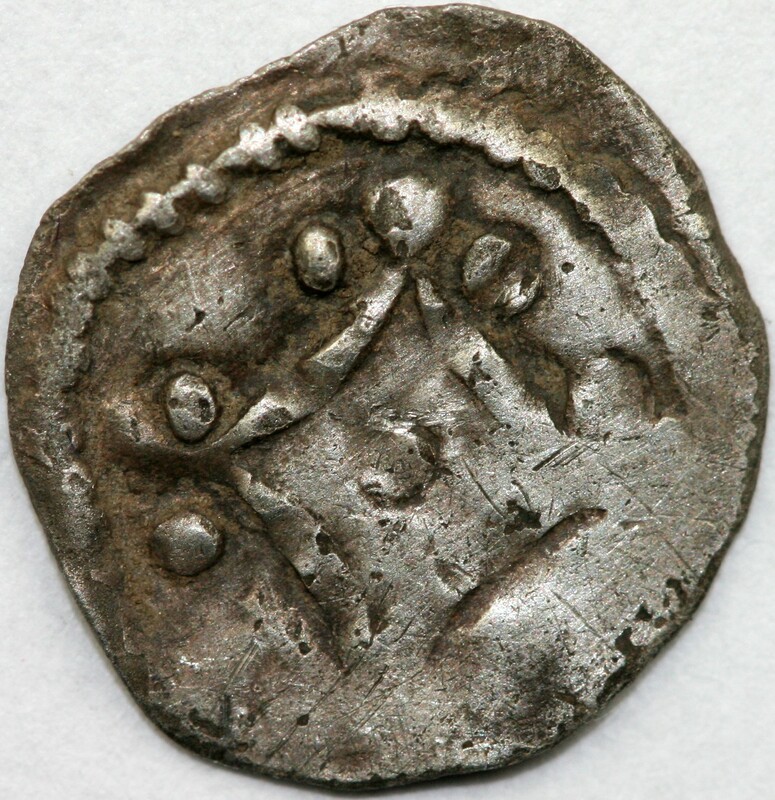 No example of this coin was in the Ulster Museum at the time "Anglo-Irish Coins in the Ulster Museum" was published. 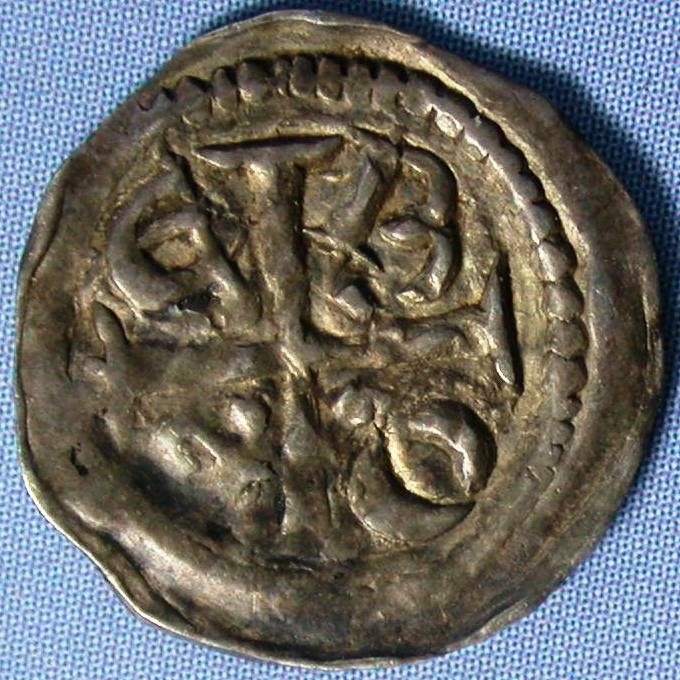 An example (legend reads ROB· ERD ON·) is in the National Museum of Ireland, Dublin (referenced and illustrated in Withers' "Irish Small Silver"). (1998) A good very fine example this coin was sold by Patrick Finn (List 13, 1998, Item 412). Patrick Finn noted: "A very difficult coin to find; in DF (DOWLE & FINN, P. 1969: A Guide Book to the Coinage of Ireland from 995AD to the Present Day) I illustrate one of the more common crude contemporary forgeries (52A). As far as I know this is only the fourth recorded specimen by ROBERD. There are two in the National Museum of Ireland, and one in the Ulster Museum. There may however be one in the BM." Crowned bust - crudely made from pellets - in triangle, stars either side. Legends blundered. Sun with pellet above within a triangle. Legends blundered. Sun with pellet above within a triangle. 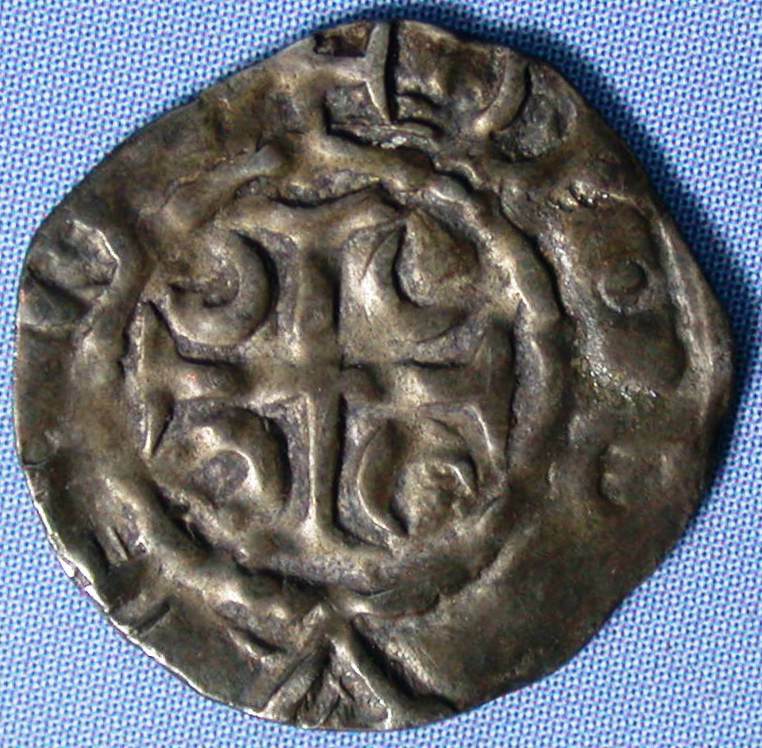 Another example is in the Fitzwilliam Museum, Cambridge (referenced and illustrated in Withers' "Irish Small Silver"). An example sold on eBay.